UPDATE: Reposting to add a new Instagram video. See below! Click the album cover to hear and/or buy this track from our cd In Odess. Sometime after this cd came out, my Yiddish teacher Sheva Zucker informed me that "OYF" was now rendered as "AF" in proper Yiddish transliteration. OOF! So my alphabetizing is wrong and also it's harder to find this song. Which now should be called, I guess, "Af a maskn bal." In the 1929 collection of theater song hits from the Yiddish kleynkunst venues Azazel and Sambatiyon there are TWO songs about masked balls. I suppose the opportunities for farcical unmaskings were irresistible. 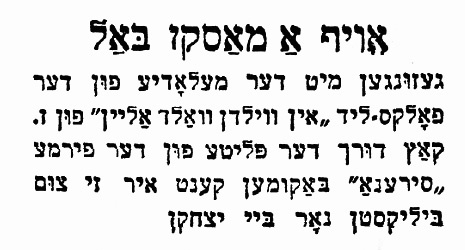 Zhelonek specified this one was to be sung to the tune of In vildn vald aleyn (a very German-sounding folk song I found published in a 1938 Yiddish folk song collection) and that Zisha Katz was the singer on a Sirena record which "you can get cheapest only at Itzok's place." Randy sang the sneaky husband performing entrapment on his flirtatious wife; I sang the sneaky wife who gets her comeuppance. Here's a short video of the song which I made for Instagram, click the picture below. The Polish word pokrake, which my Yiddish teacher Sheva Zucker translates as "good-for-nothing," has been translated on the web as "freak." me into the hall, into a corner where nobody will see." "My husband isn't here, do my will," she said. She said he was playing cards. "if you want to deceive your husband in a corner..."
I need him like a hole in the head." my freak. Now you aren't alone. You're going home."